The Redmi 5 runs on Xiaomi's own MIUI 9 - a neat launcher based on the latest Android Nougat version - 7.1.2. The exact build our review unit is running has the following identifiers - "MIUI 9.2 | Stable 9.2.2.0(NDACNEK)". The only reason we are putting it out there is that to the best of our knowledge, this particular ROM is based on a Chinese beta branch of MIUI, with Google Play Services and other internalization added on by the seller, rather than Xiaomi. While we do understand the need for such an approach, since there is still no Global official ROM for the Redmi 5, we do have a few concerns. For one, this approach is taking you off of the official ROM branches and thus likely limiting or entirely cancelling out your upgrade path and, potentially worse, fixes and security patches. Still, if that is a concern for you, unlocking the bootloader and flashing on official MIUI ROM eventually shouldn't be much of a problem at some point. But, we digress. Beta channel or not, in its current state the ROM we got is perfectly usable, complete with Google Play services and a proper English translation. MIUI remains one of the cleanest, yet feature-rich and customizable Android flavours out there. 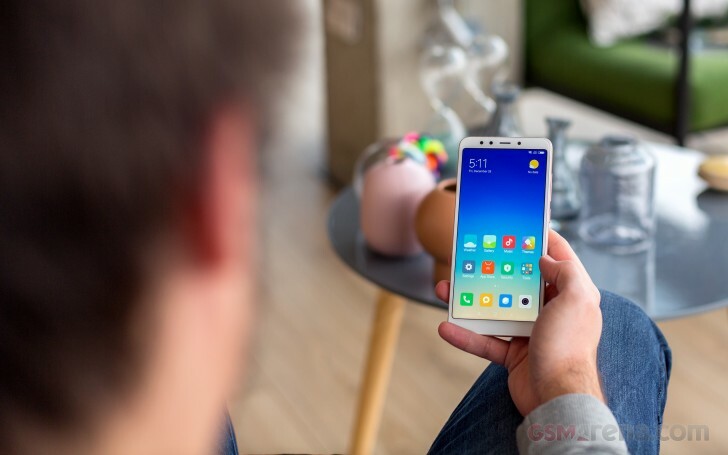 MIUI 9 builds on v.8 with multi-window support, quick replies for notifications, smart app launcher, smart assistance, and smart image search. Yes, there is a lot of "smart" with MIUI 9 and it's made possible thanks to the new machine learning process. There are tons of improvements under the hood, too, such as better RAM management, faster performance, lighter on resources, and improved Doze mode for standby power efficiency. On the surface, the UI is still very clean and clutter-free. The lock screen only has a couple of shortcuts. A swipe to the right does reveal a Mi Home, Mi Remote and flashlight interface. This is especially convenient if you own other Xiaomi tech. The main UI comprises of pages to drop all your apps, widgets and potentially folders to organise it all. The absence of an app drawer is still the preferred Xiaomi approach. The notification drawer comes from the top and has the usual quick toggles. There is a Quick Card pane, the leftmost one. It's quite similar to Today's page in iOS. It contains different cards with relevant information - recent apps, step counter, notes, calendar events, the weather, and favorites, among others. You can configure what shows up here, or you can disable this altogether. Swiping up on the home screen opens up a system-wide search interface. The app switcher feels like it came out of iOS - apps are represented by appropriate thumbnails in the same manner, but there is an additional key for the Split Screen mode. MIUI 9 adds native support for multi-tasking via the new Split Screen feature. It allows you to launch two apps side-by-side. All native apps support it and, luckily, all third-party apps with support for any kind of split screen mode work flawlessly on MIUI 9 side-by-side view. The launcher has a few other options to play around with as well. Nothing too fancy, but you still get the flexibility of choosing a default home pane, as well as some fun transition animations. Speaking of customization, themes are fully supported, and several are available out of the box. You can download more and change your wallpapers, lockscreen style, system icons, font, and sounds. The only real issue here is that the store interface is in Chinese. And sadly that's not an isolated issue. It appears to be a side effect from translating a Chinese ROM to make it more Western-friendly. Take the Security app, for instance. It can scan your phone for malware, manage your blacklisted numbers, manage or restrict your data usage, configure battery behavior, and free up some RAM. It can also manage the permissions of your installed apps, and allows you to define the battery behavior of selected apps and applies restrictions only to the apps you choose. Great, but you do have to tolerate some remaining Chinese here and there. The same goes for the multimedia applications. Xiaomi has its own Video and Music players. Both are pretty full-featured, so no complaints there. 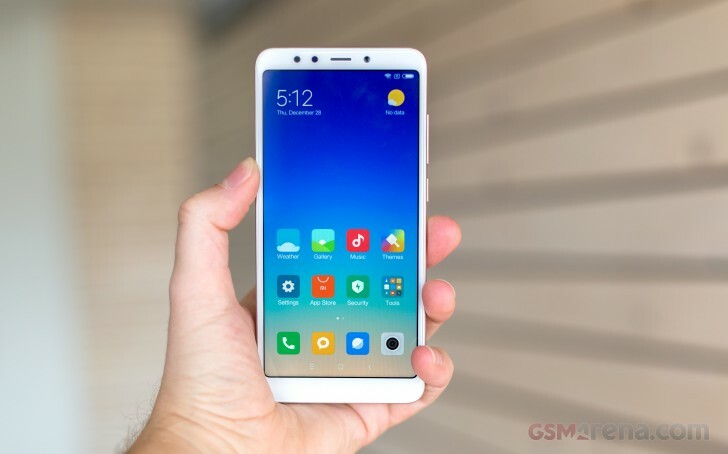 However, just like the Themes and Security apps, this ROM comes with their Chinese versions and an abundance of ads and features meant to enable access to Xiaomi's streaming platforms. The official ROMs generally pluck these out, since they are of little use outside the company's home market. At least the Gallery app has no such issues. No cloud services to speak off, just straight-forward albums and photo streams. The editing options also offer no surprises. Performance numbers from the Xiaomi Redmi 5 fall in line with our initial expectations. This is only the second time we are taking a closer look at the Snapdragon 450 chipset. Well, technically third, if you count the vivo V7 and V7+ as distinct enough to count twice. Regardless, our impressions of the new 14nm silicon are just as positive this time around. To begin with, the 14nm manufacturing process makes for great power efficiency, especially when coupled with eight Cortex-A53 cores, tuned for endurance, rather than performance. Even so, the cores in question can clock as high as 1.8GHz and actually pack quite a decent punch. GeekBench paints a clear picture of the Snapdragon 450, coming in just a bit behind the Snapdragon 625 CPU performance levels. Perhaps even on par. It is also clearly better than the older and less efficient Snapdragon 430, as found in some recent Nokia phones, among others. Surprisingly enough, the Redmi 5 seems to chew up multi-threaded loads nearly as good as its Mi A1 sibling. Still, the price difference between the two is hardly wide enough to make the Redmi 5 a better option overall. But more on that in the conclusion. But these are only CPU numbers. What about the broader picture? Perhaps the Redmi 5 has an under-performing memory or storage component hidden away somewhere in the mix to keep costs down? Well, Basemark OS 2.0 gives no such indications. Again, we find the Redmi 5 holding its own amid more expensive competitors when exposed to a more balanced and real-words load scenario. AnTuTu tells a nearly identical tale. The chart seems logical from a purely specs perspective as well - the vivo V7 and V7+, along with the Redmi 5 are bumped down a notch below the Snapdragon 625 competition. These surprisingly good results for the price segment extend into the GPU department as well. It is only logical, since the Snapdragon 450 uses the same Adreno 506, utilized inside the Snapdragon 625 and 626. The only notable difference is a small step down in clock speed of 50MHz (down from the original 650MHz). That difference in frequency is enough to explain the off-screen rendering frame count variance of a few fractions of a frame. As for on-screen rendering, the Redmi 5 has a hidden advantage, of sorts. Its lower screen resolution means the GPU has to work a lot less to output the images at native resolution. This might just be the better bet for gaming purposes, especially as far as budget smartphone choices go. Basemark X is a bit less favourable towards the Redmi 5, but not by much. The Snapdragon 450 really does represent a new wave of chips that we have been hoping to see for a while now. Ones leveraging advanced manufacturing processes for power efficiency improvements, rather than achieving pure number-crunching performance to top benchmark charts. The simple truth is most mobile chips are already quick and powerful enough to accommodate the average user needs, which makes power autonomy and battery efficiency the far more valuable and desirable trait to pursue. The Snapdragon 450 definitely delivers on that end and it's breathing down the neck of last year's Snapdragon 625, which is commendable.